Herbert William "Bud" Phelps Jr. Provide comfort for the family of Herbert Phelps Jr. with a meaningful gesture of sympathy. Herbert William “Bud” Phelps Jr., 62, widower of Dora Johnson Phelps, passed away on Friday, March 15th, 2019. He was born in Hamilton, Ohio, son of the late Herbert William Phelps Sr. and Pearl O’Der Morse. Bud retired from Procter & Gamble, where he had been a painter, and he was a former firefighter with the Wiliamstown Fire Department. He enjoyed fishing, hunting, going to flea markets and selling vintage currency. Bud is survived by his two daughters, Amanda (Brandon) Morris and Amberly Phelps; thirteen grandchildren, Rosa, Laura, Katlin, Carlin, Frankie, Blane, Noah, Alexis, Harley, Danny, Ryleigh, Mark and Hunter; one great-grandson, Cayden; three sisters, Marleen Lainhardt, Linda Martin and Jerri Johnson; a special cousin, Rick Ader. 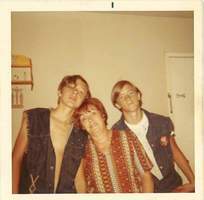 In addition to his wife and parents, Bud was preceded in death by his son, Josh Phelps and his brother Charlie “Peanut” Parish. Bud’s Celebration of Life Service will be held on Saturday, March 30th at 2PM with Bishop Rex Holt officiating. To plant a memorial tree in honor of Herbert William "Bud" Phelps Jr., please visit our Heartfelt Sympathies Store. 0 trees have been planted in memory of Herbert William "Bud" Phelps Jr.
May the family of Herbert William Phelps jr. please accept my sincere condolences hoping you find comfort in God's words at Acts 24 : 15 and Psalm 37 : 29.